Mr. Sneller's 3rd grade class from Zeeland Christian School held their annual agricultural lesson outside our barn on Thursday, April 14. Debruyn Seed Store was kind enough to donate the corn so that the class could see how the machine works. 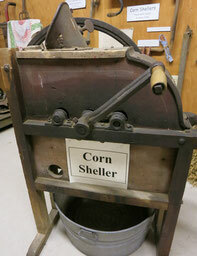 Our Model 14A Hocking Valley corn sheller was manufactured by Merrel & Company (Toledo, OH) around 1900. Want to see how it works? Watch the two videos below. The second video, also in slow motion, shows the view from the back. Mr. Sneller said the kids were talking about it all day on Friday too!